WOODLANDS, Texas (KTRK) -- The Howard Hughes Corporation announced details about The Woodlands Hills, a 2,000-acre master-planned community under development in north Conroe and Willis, during a presentation on Monday morning. The community will feature more than 4,500 residences, 112 acres of open space, 20 neighborhood parks and a village park, a retail village center, extensive hike and bike trails and dedicated bike lanes, said Heath Melton, vice president of residential development at the The Woodlands Development Company. "The Woodlands Hills will feature gently rolling terrain for its natural amenities and acres of green space," TWDC Co-President Tim Welbes said. "We plan to develop The Woodlands Hills with the same high standards and commitment to environmental preservation that have continued to make The Woodlands and Bridgeland, two of the best-selling communities in the nation, with a wide variety of housing options and extensive outdoor recreation." Welbes said the community will feature a variety of retail options, including a retail village center in the middle of the development as well as retail property along FM 1097, FM 830 and League Line Road. "The Woodlands Hills captures and extends The Woodlands tradition," Melton said. "The community is forested with natural terrain and has hills that are unique to this area. We will maintain the same high-level development standards that has made The Woodlands one of the top selling master-planned communities in the nation." Company officials highlighted plans for a 17-acre Village Park, which will help launch the community upon opening. 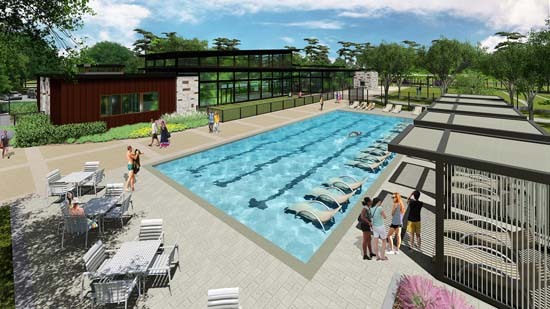 Plans include an activity center, an events hall, a fitness center, a resort-style pool with a lazy river, lap lane fitness pool, playground as well as tennis courts and a dog park. "It is really nicely nestled in the woods there," Melton said. "You can see some of the architectural appeal that we are trying to achieve. We think it is very well fitting within the surroundings, but it has a little bit of a modern flair to invite some of our residents into our community." Along with the announcement, the company launched the official website for the community and corresponding social media accounts, and billboards promoting the community will be installed starting this week. The corporation plans to announce home builders by the end of summer, and expect the community to host a grand opening celebration in spring 2018.